"Hey, we are JojoesArt and PixieCold, freelance artists from Berlin (and siblings.. :)). Yesterday we discovered, that Madonna posted an artwork of Jojoe on her official Instagram, with her own face photoshopped into the image, without mentioning him as the original artist at all. This is not the first time people get recognition for our work without giving us credit. Almost weekly we receive mails by people, who discovered our art being sold on eBay, wallpaper sites and even in shops all around the world. While we appreciate them liking our art, we would love to at least get some of that recognition also for ourselves, as we make a living by selling prints and originals of our work. 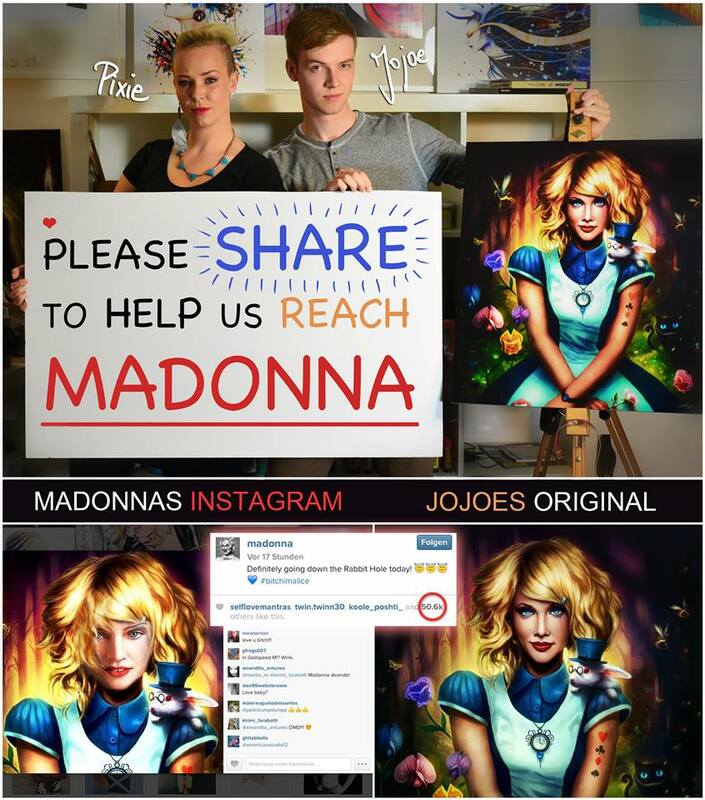 We are sure Madonna did not have any bad intentions and probably did not even know where the original picture came from, but still we think it would only be fair, if Jojoe received some kind of credit for that, especially since the post on Instagram received more than 50.000 likes. So here is our plan: We want to raise attention for the important cause of artist´s rights. Therefore we were thinking, that the easiest way in our age of social media would be, to make this post and somehow get it to reach Madonna. We know, it is kind of a crazy attempt, but we hope our message gets across! Artists have rights..."
Madonna did not have any bad intention? Yeah sure, just like with Danny Quirk.